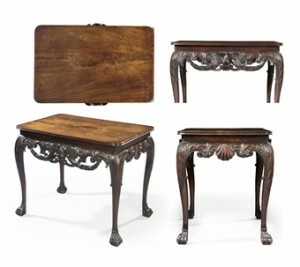 This is the most expensive piece of Irish furniture ever sold at auction. THE price record for any piece of Irish furniture was achieved at the Simon Sainsbury Sale at Christie’s in June 2008. An Irish George II mahogany centre table with exceptional colour and carved detail which had been estimated at £150,000-£250,000 actually made £421,250. The centre table or tea-table is boldly carved on all four sides, with Jupiter’s eagle on the long sides and Venus’s shell badge on the short sides. The eagles hold oak leaf swags, also sacred to Jupiter. The heavily carved apron below a plain frieze is typical of mid-18th Century Irish cabinet-making. This table exemplifies the best of Irish craftsmanship. Measurements are 28 in. (71 cm.) high; 36¼ in. (92 cm.) wide; 24 in. (61 cm.) deep. Simon Sainsbury, scion of the famous retailing family, died in 2006. The most expensive piece of furniture at the sale was a late George II mahogany side table set on six square profile legs carved with acanthus and bell flower motifs. It made £720,000.